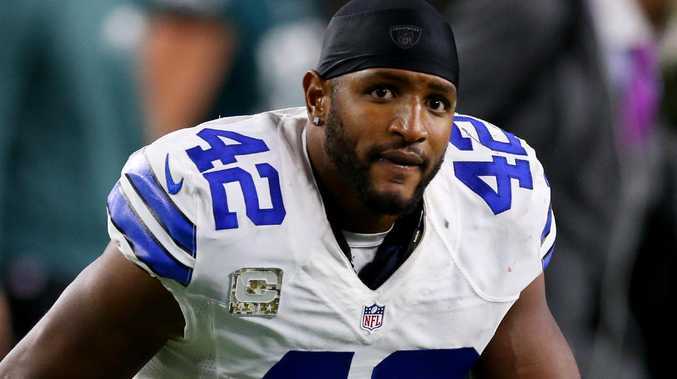 Barry Church had a big night out in London. THE American football stars who were involved in a nightclub brawl over an $AUD90,000 bar bill have been named. 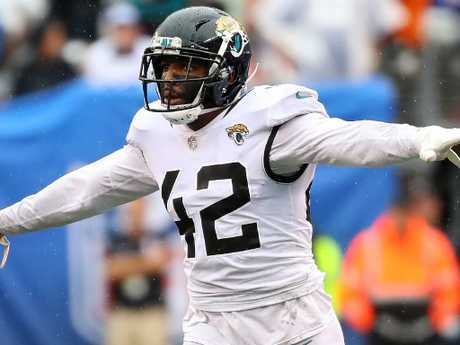 The four Jacksonville Jaguars players - Barry Church, Ronnie Harrison, DJ Hayden and Jarrod Wilson - were arrested by police in London at 4am on Saturday, The Sun reports. The players, who earn an average of $78,000 a week, allegedly squared up to bouncers outside the nightspot. 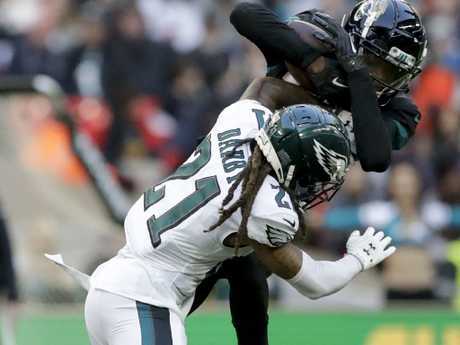 The Jaguars were in London for an NFL match against Philadelphia Eagles at Wembley Stadium on Sunday, which they lost 24-18. On its website, the venue is described as "an aerial show club bringing an eclectic mix of Las Vegas and Moulin Rouge to the heart of London's West End". It has confetti cannons, a jellyfish tank and a waterfall. On Saturday it was running a "Welcome to Gotham" themed event. Barry Church was flying high on his big night out before he and his teammates saw the bill. The players sank champagne, starting at $815 a bottle, and vodka. A source told The Sun: "The total bill was in the region of $90,000 and some of the lads tried to leave the club but were prevented from doing so by security. 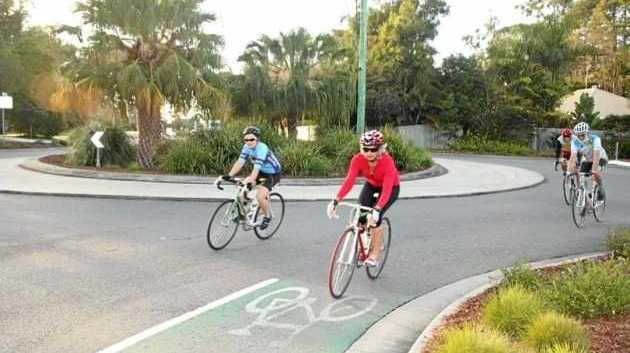 "Things got pretty heated and there was a lot of swearing and shouting and things became physical. "In terms of preparation for their match, you couldn't think of anything worse." The players were released after nine hours in custody. It's understood the nightclub dropped the complaint after the bill was settled. Speaking after his team's loss to Philadelphia, Church said: "There was definitely a misunderstanding, but as far as my actions are concerned, I take full responsibility. "I don't want to be a distraction or anything like that to my team and my teammates, but we handled it as a private matter within the team and we'll just go from there." He declined to say how long he and his teammates were detained or whether any punches were thrown at the nightclub, located near Piccadilly Circus. A night on the town wasn’t the best preparation for Jacksonville as it lost to Philadelphia. The 30-year-old added: "I don't want to get into any details about that, but we were just hanging out as a team. That's it. "It's just disappointing how it went down. I didn't want to be a distraction or anything like that, but hey, it happened. "I took full responsibility for it with my teammates, and we just weren't able to pull a victory out today. It just kind of adds to it. That's what happened." He said: "We're still gathering information from it. Obviously, before we start going on the field to perform better, we've got to take a good look at what we're doing all the other times - when we're in the building, out of the building and all those things." A spokesman said: "Officers attended and spoke with a group of males who had allegedly been attempting to leave the venue without paying a large bill. "Four men aged in their 20s were subsequently arrested on suspicion of fraud by false representation and taken to a central London police station for questioning. They were all subsequently released with no further action." London has hosted at least one NFL game a year since 2007 as part of the league's International Series.